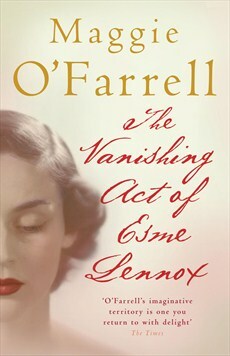 After last week’s Maggie-fest, I went home, picked up my copy of The Vanishing Act of Esme Lennox, and read it in two days. It’s not very long, and my copy has quite wide set print, but I read it so quickly mostly because it was compulsive. It is, simply, an amazing book. Examined once the book is finished, the story is actually quite complicated and ‘sweeping’, but it is written quite simply and sensitively, taking in great emotions and drama but never – not once – being melodramatic or sensationalist. The narrative I found to be almost dream-like at times, as it flits effortlessly between Esme in the 1930s, Iris in the mid 2000s, and Kitty’s stream-of-consciousness narrative from within her Alzheimer’s-riddled mind (also in mid 2000s). O’Farrell’s choice to give Kitty Alzheimer’s in her old age is the perfect device to demonstrate the importance of memory and perception within the wider story, as well as the ways in which we interpret our present lives. Esme is a character so beautifully drawn that she could almost be analysed as if she were a real person. We see her in childhood, and in old age, with her fateful adolescence in between. Her experiences of early life in India – as well as the typhoid outbreak and the death of her ayah – reminded me very much of Mary Lennox in The Secret Garden (one of my all-time favourites). Though Mary is completely abandoned and Esme remains with her family, both are taken away to a completely different life without being given a choice, and are expected to adapt to a new world that they do not understand at all. Esme’s ‘problem’ is that she is stubborn, independent, and defiant. She refuses to be bored, and this refusal dictates her entire life. Mental health and societal perceptions of it are crucial to this story. In 1930s Edinburgh, a woman could be locked away for being deemed ‘difficult’ by male relatives, and left to languish in a psychiatric hospital. But it is not just these thankfully now outdated views that are examined. In the modern day narrative of Iris and the elderly Esme, mental health still has its stigmas. Iris’ stepbrother Alex cannot believe that she is taking on this ‘mad old woman’ who is apparently her great aunt. There is a mistrust of ‘madness’ and a fear of it, but also, it seems to me, a lack of understanding. Alex represents the view that it is best left alone. The Vanishing Act of Esme Lennox is one of those deceptively simple books that stays with you long afterwards. It is a book that Maggie O’Farrell fans tend to really love, and I am not at all surprised. Brava, Maggie, brava. Published in 2006 by Headline. → Women’s Prize Longlist Announced! But Who Will Be On The Shortlist? ← Maggie O’Farrell Fever: The Heatwave Is Here! This book sounds like it has a really interesting premise and explores fascinating societal issues. (And the cover is so pretty!) I haven’t read any Maggie O’Farrell, but I think I need to! It is really beautiful and fascinating. This is the second O’Farrell I’ve read and I’ll definitely read more. Having seen reviews of Instructions for a Heatwave, I was interested to read more by Maggie O’Farrell and opted for The Vanishing Act of Esme Lennox. I enjoyed how this short novel subtly explored how identity is shared and differs across generations of the same family. Maggie O’Farrell writes beautifully about the private dramas of family life. Am looking forward to reading the Helena Rubenstein book too. Izzy – – totally agree about O’Farrell, and will definitely read more of her work. Have you read Heatwave yet? The Rubinstein book is excellent so far, I’ll let you know when I review it! Haven’t read Heatwave yet but it’s on my list — am finishing Room No 10 at the moment and next up is Paulo Coehli but the Coehli book is short so it will be back to Maggie again after that. Loving your blog — I like the selections a lot!